This book is great summer reading. If you take it with you on vacation or to the pool you’ll not be able to put it down. 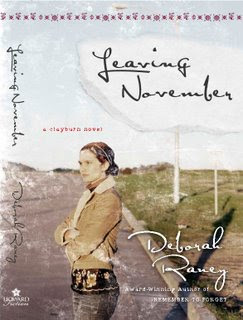 In Leaving November, we visit the community of Clayburn again from the book Remember to Forget. The author pulled me in from the first page with Vienne’s return to Clayburn after she failed her bar exam for the second time, then stays to help her mother after a stroke. Vienne turns her mother’s café into a coffee shop just across the street from the art gallery owned by Jack, who she had a crush on in her high school years. She plans to only stay in Clayburn until her mother’s health returns, but finds herself falling hard for Jack. But there is just one problem-- he has a past of his own to deal with. Alcohol. One that Vienne swore to herself she would never allow into her life because of her father’s history. Crafted in such a way that we are able to see and understand Jack’s addiction, gave me great insight on how one struggles to overcome alcoholism. This is a wonderful story of triumph over personal life issues that affect our relationships and at the very core of our lives. It’s a story of trust, love and forgiveness, which brings hope to each new day. This book is not to be missed!